When we were packing suitcases for our last trip to Europe, I had a brilliant idea: why don’t we take a power cord with extender, so we can power up all our gadgets using single converter! I browsed through (not so small) collection of extenders and picked the very best one! It had all the bells and whistles you expect from high end extender cord: surge protection, lots of outlets… the whole shmo. In retrospect, I should have known that this would happen. The problem was due to the difference in voltage. In the US, we have 110V when in Europe most countries have 220-240V. The original idea – to bring an extender – was good one. 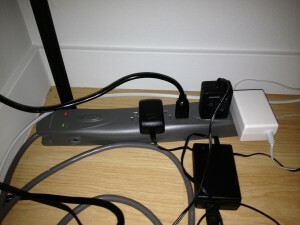 What I did not realize – is that surge protection circuits can not handle double of voltage. If I brought with me the most simple extender, all would be well. When you get to an unknown place, learn where a fuse box is located as soon as possible. If you need to take an extender (due to the number of gadgets), consider the very basic one. The one which DOES NOT have surge protection. In a pinch, iPhone screen does provide enough light to do some emergency searching in the unknown place. Just been checking out your blog – must read the posts on Costa Rica – we’re going there next year having heard such good things about it. Costa Rica is a fantastic country with very warm and friendly people. Unfortunately, since it’s quickly becoming a very popular destination for US visitors, some places are transforming into “just another resort in a tropical paradise”. It was clearly the case of the Arenal area. However, as soon as you go off the beaten path (and in some cases it was just a matter of turning onto any secondary road) it’s becoming tranquil and colorful at the same time. I hope you would enjoy your visit to Costa Rica. You can buy surge protector multi-socket extenders that are good for anywhere from 110 to 250 volt – at least you can in Canada. Ours also has the added feature that the sockets are good for any type of plug – North American, British, Australian, European etc can all be plugged into it. We never travel without it because in third world countries there’s often power surges, and also in any county when there’s lightening around.